News | Congressman John Lewis wows BookExpo crowds with MARCH: BOOK ONE! 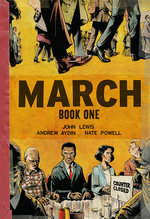 Congressman John Lewis wows BookExpo crowds with MARCH: BOOK ONE! BookExpo America, held last weekend in New York, is the American book industry's biggest trade show -- and also happened to be the first event in our long promotional tour with Congressman John Lewis for his graphic novel with Andrew Aydin & Nate Powell, March: Book One! And judging from the reaction, we're off to a fantastic start. Rep. Lewis and Andrew Aydin first turned heads with an "early bird" booth appearance on Friday, welcoming a continuous line of fans to get their free 24-page MARCH excerpt booklets signed, before rushing off to the Huffington Post studio for a live interview on HuffPost Live! This feature, hosted by rising star Alicia Menendez, featured insightful questions from both Menendez and viewers at home, as Lewis and Aydin expressed their hope that MARCH could pass on the lessons and tools of the 1960s to young activists fighting for equality today. Watch it now! Then came the big day: Saturday! It began with perhaps BEA's flagship event, the Author Breakfast, featuring host Chris Matthews together with Helen Fielding (Bridget Jones), Congressman Lewis, and Diana Gabaldon (Outlander). Rep. Lewis kept the crowd of 1,000 industry pros spellbound, alternating between stories of his rural childhood, memories of the civil rights movement, and passionate calls to action. After another short video interview, we were off to another stage for the "Road to a Bestseller" panel featuring Rep. Lewis and wunderkind novelist Jason Mott (The Returned) -- two generations of African-American authors with huge books this year. At last, we came to the official signing - this one with a line stretching "down the block"! (P.S. Did we mention a camera crew from Bill Moyers & Company had been following us since breakfast?) After two straight hours (and a few drained markers), it was time to call it a day. Andrew and Rep. Lewis said goodbye to BEA, exhausted but energized... Just in time to see the starred review in Booklist, the official review journal of the American Library Association, calling March "a grand work," and see it featured in the Washington Post's "Summer Reading List: Eight Books to Make You Smarter"! Thanks to everyone who came out to see us, to the BEA staff for making it happen, and to the March co-authors for their generosity and stamina... See you next time (ALA in Chicago June 29, Comic-Con in San Diego July 20-21, and beyond)!